Rancho Club is a small but charming 2 star hotel that will appeal to anyone wanting to visit Cuba’s second largest city, Santiago de Cuba, on a budget. Rancho Club hotel provides basic though comfortable facilities, with fine views of the city & mountains that are great for holiday photos. The shops, bars, restaurants & tourist attractions of central Santiago de Cuba are a 10-minute drive away so taxis are recommended as there is little entertainment at the hotel. There is parking available for those who choose car hire. Islazul Rancho Club has a well kept pool & terrace area where you can relax amid breathtaking views, although the fun ends there as far as hotel entertainment activities go. 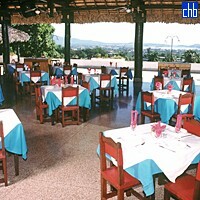 The hotel has an open air buffet restaurant, snack bar (which arguably serves the best food), nightclub & shop. 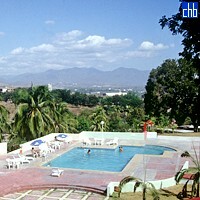 Rancho Club hotel is a good choice for anyone looking to spend time in Santiago de Cuba, while having somewhere that is inexpensive, quiet & totally relaxing nearby. The 30 ensuite rooms at Rancho Club are a decent size & reasonably well appointed, with double or twin beds, air conditioning & satellite TV. 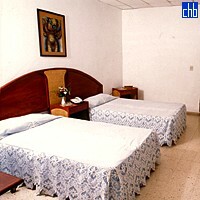 Some rooms also have a fridge, though it is recommended to check this upon booking.